1 A None No Power Seat 1 A is a standard Business Class seat that transforms into a fully-flat bed. The seat is also located at a bulkhead. The proximity to the galley and lavatory area might be bothersome. 1 C None No Power Seat 1 C is a standard Business Class seat that transforms into a fully-flat bed. The seat is also located at a bulkhead. The proximity to the galley and lavatory area might be bothersome. 1 F None No Power Seat 1 F is a standard Business Class seat that transforms into a fully-flat bed. The seat is also located at a bulkhead. The proximity to the galley and lavatory area might be bothersome. 1 H None No Power Seat 1 H is a standard Business Class seat that transforms into a fully-flat bed. The seat is also located at a bulkhead. The proximity to the galley and lavatory area might be bothersome. 10 G None No Power Seat 10 G is a standard Economy Class seat. The seat is classified as a Main Cabin Extra seat that may be selected for an additional fee and features extra legroom plus preferred boarding. 10 H None No Power Seat 10 H is a standard Economy Class seat. The seat is classified as a Main Cabin Extra seat that may be selected for an additional fee and features extra legroom plus preferred boarding. 11 G None No Power Seat 11 G is a standard Economy Class seat. The seat is classified as a Main Cabin Extra seat that may be selected for an additional fee and features extra legroom plus preferred boarding. 11 H None No Power Seat 11 H is a standard Economy Class seat. The seat is classified as a Main Cabin Extra seat that may be selected for an additional fee and features extra legroom plus preferred boarding. 12 G None No Power Seat 12 G is a standard Economy Class seat. The seat is classified as a Main Cabin Extra seat that may be selected for an additional fee and features extra legroom plus preferred boarding. 12 H None No Power Seat 12 H is a standard Economy Class seat. The seat is classified as a Main Cabin Extra seat that may be selected for an additional fee and features extra legroom plus preferred boarding. 13 G None No Power Seat 13 G is a standard Economy Class seat. The seat is classified as a Main Cabin Extra seat that may be selected for an additional fee and features extra legroom plus preferred boarding. 13 H None No Power Seat 13 H is a standard Economy Class seat. The seat is classified as a Main Cabin Extra seat that may be selected for an additional fee and features extra legroom plus preferred boarding. 14 G None No Power Seat 14 G is a standard Economy Class seat. The seat is classified as a Main Cabin Extra seat that may be selected for an additional fee and features extra legroom plus preferred boarding. 14 H None No Power Seat 14 H is a standard Economy Class seat. The seat is classified as a Main Cabin Extra seat that may be selected for an additional fee and features extra legroom plus preferred boarding. 15 G None No Power Seat 15 G is a standard Economy Class seat. The seat is classified as a Main Cabin Extra seat that may be selected for an additional fee and features extra legroom plus preferred boarding. 15 H None No Power Seat 15 H is a standard Economy Class seat. The seat is classified as a Main Cabin Extra seat that may be selected for an additional fee and features extra legroom plus preferred boarding. 16 G None No Power Seat 16 G is a standard Economy Class seat. The seat is classified as a Main Cabin Extra seat that may be selected for an additional fee and features extra legroom plus preferred boarding. 16 H None No Power Seat 16 H is a standard Economy Class seat. The seat is classified as a Main Cabin Extra seat that may be selected for an additional fee and features extra legroom plus preferred boarding. 20 A None No Power Seat 20 A is a standard Economy Class seat in a last row of the aircraft that might have limited to no recline. The proximity to the lavatory area might be bothersome. 20 B None No Power Seat 20 B is a standard Economy Class seat in a last row of the aircraft that might have limited to no recline. The proximity to the lavatory area might be bothersome. 20 C None No Power Seat 20 C is a standard Economy Class seat. The proximity to the lavatory area might be bothersome. 20 F None No Power Seat 20 F is a standard Economy Class seat. The proximity to the lavatory area might be bothersome. 20 G None No Power Seat 20 G is a standard Economy Class seat in a last row of the aircraft that might have limited to no recline. The proximity to the lavatory area might be bothersome. 20 H None No Power Seat 20 H is a standard Economy Class seat in a last row of the aircraft that might have limited to no recline. The proximity to the lavatory area might be bothersome. 21 C None No Power Seat 21 C is a standard Economy Class seat in a last row of the aircraft that might have limited to no recline. The proximity to the lavatory area might be bothersome. 21 D None No Power Seat 21 D is a standard Economy Class seat in a last row of the aircraft that might have limited to no recline. The proximity to the lavatory area might be bothersome. 21 E None No Power Seat 21 E is a standard Economy Class seat in a last row of the aircraft that might have limited to no recline. The proximity to the lavatory area might be bothersome. 21 F None No Power Seat 21 F is a standard Economy Class seat in a last row of the aircraft that might have limited to no recline. The proximity to the lavatory area might be bothersome. 23 A None No Power Seat 23 A is a standard Economy Class seat located at an Exit Row. The seat is classified as a Main Cabin Extra seat that may be selected for an additional fee and features extra legroom plus preferred boarding. The tray table and inflight entertainment monitor are installed in a fixed armrest, therefore, slightly reducing seat width. Floor storage for personal items is not available for use during takeoff and landing. The proximity to the lavatory area might be bothersome. 23 B None No Power Seat 23 B is a standard Economy Class seat located at an Exit Row. The seat is classified as a Main Cabin Extra seat that may be selected for an additional fee and features extra legroom plus preferred boarding. The tray table and inflight entertainment monitor are installed in a fixed armrest, therefore, slightly reducing seat width. Floor storage for personal items is not available for use during takeoff and landing. The proximity to the lavatory area might be bothersome. 23 C None No Power Seat 23 C is a standard Economy Class seat located at an Exit Row. The seat is classified as a Main Cabin Extra seat that may be selected for an additional fee and features extra legroom plus preferred boarding. 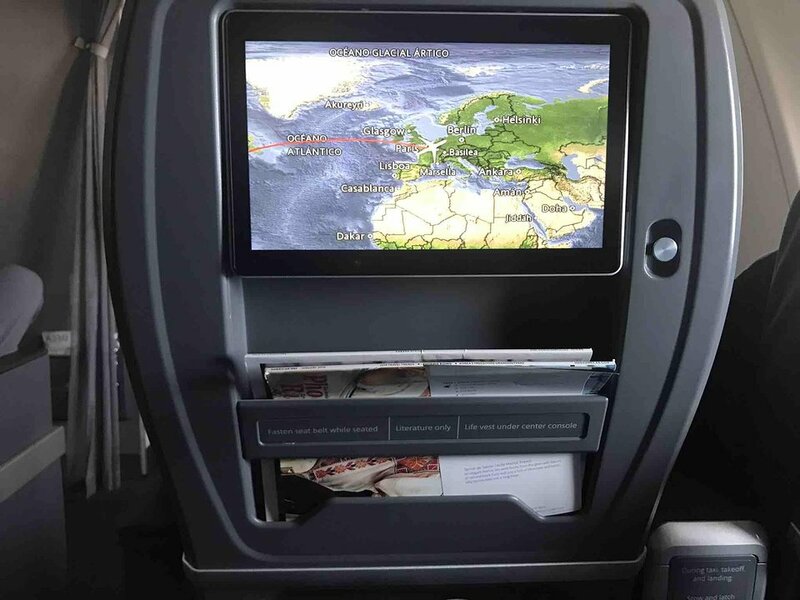 The tray table and inflight entertainment monitor are installed in a fixed armrest, therefore, slightly reducing seat width. Floor storage for personal items is not available for use during takeoff and landing. The proximity to the lavatory area might be bothersome. 23 D None No Power Seat 23 D is a standard Economy Class seat located at an Exit Row. The seat is classified as a Main Cabin Extra seat that may be selected for an additional fee and features extra legroom plus preferred boarding. The tray table and inflight entertainment monitor are installed in a fixed armrest, therefore, slightly reducing seat width. Floor storage for personal items is not available for use during takeoff and landing. The proximity to the lavatory area might be bothersome. 23 E None No Power Seat 23 E is a standard Economy Class seat located at an Exit Row. The seat is classified as a Main Cabin Extra seat that may be selected for an additional fee and features extra legroom plus preferred boarding. The tray table and inflight entertainment monitor are installed in a fixed armrest, therefore, slightly reducing seat width. Floor storage for personal items is not available for use during takeoff and landing. The proximity to the lavatory area might be bothersome. 23 F None No Power Seat 23 F is a standard Economy Class seat located at an Exit Row. The seat is classified as a Main Cabin Extra seat that may be selected for an additional fee and features extra legroom plus preferred boarding. The tray table and inflight entertainment monitor are installed in a fixed armrest, therefore, slightly reducing seat width. Floor storage for personal items is not available for use during takeoff and landing. The proximity to the lavatory area might be bothersome. 23 G None No Power Seat 23 G is a standard Economy Class seat located at an Exit Row. The seat is classified as a Main Cabin Extra seat that may be selected for an additional fee and features extra legroom plus preferred boarding. The tray table and inflight entertainment monitor are installed in a fixed armrest, therefore, slightly reducing seat width. Floor storage for personal items is not available for use during takeoff and landing. The proximity to the lavatory area might be bothersome. 23 H None No Power Seat 23 H is a standard Economy Class seat located at an Exit Row. The seat is classified as a Main Cabin Extra seat that may be selected for an additional fee and features extra legroom plus preferred boarding. The tray table and inflight entertainment monitor are installed in a fixed armrest, therefore, slightly reducing seat width. Floor storage for personal items is not available for use during takeoff and landing. The proximity to the lavatory area might be bothersome. 24 A None No Power Seat 24 A is a standard Economy Class seat. The seat is classified as a Main Cabin Extra seat that may be selected for an additional fee and features extra legroom plus preferred boarding. 24 B None No Power Seat 24 B is a standard Economy Class seat. The seat is classified as a Main Cabin Extra seat that may be selected for an additional fee and features extra legroom plus preferred boarding. 24 C None No Power Seat 24 C is a standard Economy Class seat. The seat is classified as a Main Cabin Extra seat that may be selected for an additional fee and features extra legroom plus preferred boarding. 24 D None No Power Seat 24 D is a standard Economy Class seat. The seat is classified as a Main Cabin Extra seat that may be selected for an additional fee and features extra legroom plus preferred boarding. 24 E None No Power Seat 24 E is a standard Economy Class seat. The seat is classified as a Main Cabin Extra seat that may be selected for an additional fee and features extra legroom plus preferred boarding. 24 F None No Power Seat 24 F is a standard Economy Class seat. The seat is classified as a Main Cabin Extra seat that may be selected for an additional fee and features extra legroom plus preferred boarding. 24 G None No Power Seat 24 G is a standard Economy Class seat. The seat is classified as a Main Cabin Extra seat that may be selected for an additional fee and features extra legroom plus preferred boarding. 24 H None No Power Seat 24 H is a standard Economy Class seat. The seat is classified as a Main Cabin Extra seat that may be selected for an additional fee and features extra legroom plus preferred boarding. 25 A None No Power Seat 25 A is a standard Economy Class seat. The seat is classified as a Main Cabin Extra seat that may be selected for an additional fee and features extra legroom plus preferred boarding. 25 B None No Power Seat 25 B is a standard Economy Class seat. The seat is classified as a Main Cabin Extra seat that may be selected for an additional fee and features extra legroom plus preferred boarding. 25 C None No Power Seat 25 C is a standard Economy Class seat. The seat is classified as a Main Cabin Extra seat that may be selected for an additional fee and features extra legroom plus preferred boarding. 25 D None No Power Seat 25 D is a standard Economy Class seat. The seat is classified as a Main Cabin Extra seat that may be selected for an additional fee and features extra legroom plus preferred boarding. 25 E None No Power Seat 25 E is a standard Economy Class seat. The seat is classified as a Main Cabin Extra seat that may be selected for an additional fee and features extra legroom plus preferred boarding. 25 F None No Power Seat 25 F is a standard Economy Class seat. The seat is classified as a Main Cabin Extra seat that may be selected for an additional fee and features extra legroom plus preferred boarding. 25 G None No Power Seat 25 G is a standard Economy Class seat. The seat is classified as a Main Cabin Extra seat that may be selected for an additional fee and features extra legroom plus preferred boarding. 25 H None No Power Seat 25 H is a standard Economy Class seat. The seat is classified as a Main Cabin Extra seat that may be selected for an additional fee and features extra legroom plus preferred boarding. 26 C None No Power Seat 26 C is a standard Economy Class seat. The seat is classified as a Main Cabin Extra seat that may be selected for an additional fee and features extra legroom plus preferred boarding. 26 D None No Power Seat 26 D is a standard Economy Class seat. The seat is classified as a Main Cabin Extra seat that may be selected for an additional fee and features extra legroom plus preferred boarding. 26 E None No Power Seat 26 E is a standard Economy Class seat. The seat is classified as a Main Cabin Extra seat that may be selected for an additional fee and features extra legroom plus preferred boarding. 26 F None No Power Seat 26 F is a standard Economy Class seat. The seat is classified as a Main Cabin Extra seat that may be selected for an additional fee and features extra legroom plus preferred boarding. 32 C None No Power Seat 32 C is a standard Economy Class seat. The seat back, due to aisle positioning, might be bumped by a passenger or crew member passing from the rear of the aircraft. 32 F None No Power Seat 32 F is a standard Economy Class seat. The seat back, due to aisle positioning, might be bumped by a passenger or crew member passing from the rear of the aircraft. 33 C None No Power Seat 33 C is a standard Economy Class seat that is not aligned with the row in front. The alignment will affect underseat storage and legroom. The tray table is installed in a fixed armrest, therefore, slightly reducing seat width. 33 D None No Power Seat 33 D is a standard Economy Class seat that is not aligned with the row in front. The alignment will affect underseat storage and legroom. The tray table is installed in a fixed armrest, therefore, slightly reducing seat width. 33 F None No Power Seat 33 F is a standard Economy Class seat that is not aligned with the row in front. The alignment will affect underseat storage and legroom. The tray table is installed in a fixed armrest, therefore, slightly reducing seat width. 35 B None No Power Seat 35 B is a standard Economy Class seat. The proximity to the galley and lavatory area might be bothersome. 35 C None No Power Seat 35 C is a standard Economy Class seat. The proximity to the galley and lavatory area might be bothersome. 35 F None No Power Seat 35 F is a standard Economy Class seat. The proximity to the galley and lavatory area might be bothersome. 35 G None No Power Seat 35 G is a standard Economy Class seat in a last row of the aircraft that might have limited to no recline. The proximity to the galley and lavatory area might be bothersome. 35 H None No Power Seat 35 H is a standard Economy Class seat in a last row of the aircraft that might have limited to no recline. The proximity to the galley and lavatory area might be bothersome. 36 A None No Power Seat 36 A is a standard Economy Class seat in the last row of the aircraft that might have limited to no recline. The proximity to the galley and lavatory area might be bothersome. 36 B None No Power Seat 36 B is a standard Economy Class seat in the last row of the aircraft that might have limited to no recline. The proximity to the galley and lavatory area might be bothersome. 36 C None No Power Seat 36 C is a standard Economy Class seat in the last row of the aircraft that might have limited to no recline. The proximity to the galley and lavatory area might be bothersome. 36 D None No Power Seat 36 D is a standard Economy Class seat in the last row of the aircraft that might have limited to no recline. The proximity to the galley and lavatory area might be bothersome. 36 F None No Power Seat 36 F is a standard Economy Class seat in the last row of the aircraft that might have limited to no recline. The proximity to the galley and lavatory area might be bothersome. 4 F None No Power Seat 4 F is a standard Business Class seat that transforms into a fully-flat bed. 5 F None No Power Seat 5 F is a standard Business Class seat that transforms into a fully-flat bed. The proximity to the galley and lavatory area might be bothersome. 5 H None No Power Seat 5 H is a standard Business Class seat that transforms into a fully-flat bed. The proximity to the galley and lavatory area might be bothersome. 6 A None No Power Seat 6 A is a standard recliner-style Premium Economy seat located at a bulkhead. Floor storage for personal items is not available for use during takeoff and landing. The proximity to the galley and lavatory area might be bothersome. 6 B None No Power Seat 6 B is a standard recliner-style Premium Economy seat located at a bulkhead. Floor storage for personal items is not available for use during takeoff and landing. The proximity to the galley and lavatory area might be bothersome. 6 C None No Power Seat 6 C is a standard recliner-style Premium Economy seat located at a bulkhead. Floor storage for personal items is not available for use during takeoff and landing. The proximity to the galley and lavatory area might be bothersome. 6 D None No Power Seat 6 D is a standard recliner-style Premium Economy seat located at a bulkhead. Floor storage for personal items is not available for use during takeoff and landing. The proximity to the galley and lavatory area might be bothersome. 6 F None No Power Seat 6 F is a standard recliner-style Premium Economy seat located at a bulkhead. Floor storage for personal items is not available for use during takeoff and landing. The proximity to the galley and lavatory area might be bothersome. 6 G None No Power Seat 6 G is a standard recliner-style Premium Economy seat located at a bulkhead. Floor storage for personal items is not available for use during takeoff and landing. The proximity to the galley and lavatory area might be bothersome. 6 H None No Power Seat 6 H is a standard recliner-style Premium Economy seat located at a bulkhead. Floor storage for personal items is not available for use during takeoff and landing. The proximity to the galley and lavatory area might be bothersome. 7 A None No Power Seat 7 A is a standard recliner-style Premium Economy seat. 7 B None No Power Seat 7 B is a standard recliner-style Premium Economy seat. 7 C None No Power Seat 7 C is a standard recliner-style Premium Economy seat. 7 D None No Power Seat 7 D is a standard recliner-style Premium Economy seat. 7 F None No Power Seat 7 F is a standard recliner-style Premium Economy seat. 7 G None No Power Seat 7 G is a standard recliner-style Premium Economy seat. 7 H None No Power Seat 7 H is a standard recliner-style Premium Economy seat. 8 A None No Power Seat 8 A is a standard recliner-style Premium Economy seat that is missing a window. 8 B None No Power Seat 8 B is a standard recliner-style Premium Economy seat. 8 C None No Power Seat 8 C is a standard recliner-style Premium Economy seat. 8 D None No Power Seat 8 D is a standard recliner-style Premium Economy seat. 8 F None No Power Seat 8 F is a standard recliner-style Premium Economy seat. 8 G None No Power Seat 8 G is a standard recliner-style Premium Economy seat. 8 H None No Power Seat 8 H is a standard recliner-style Premium Economy seat that is missing a window. 9 A None No Power Seat 9 A is a standard Economy Class seat located at a bulkhead. The seat is classified as a Main Cabin Extra seat that may be selected for an additional fee and features extra legroom plus preferred boarding. The tray table and inflight entertainment monitor are installed in a fixed armrest, therefore, slightly reducing seat width. Floor storage for personal items is not available for use during takeoff and landing. 9 B None No Power Seat 9 B is a standard Economy Class seat located at a bulkhead. The seat is classified as a Main Cabin Extra seat that may be selected for an additional fee and features extra legroom plus preferred boarding. The tray table and inflight entertainment monitor are installed in a fixed armrest, therefore, slightly reducing seat width. Floor storage for personal items is not available for use during takeoff and landing. 9 C None No Power Seat 9 C is a standard Economy Class seat located at a bulkhead. The seat is classified as a Main Cabin Extra seat that may be selected for an additional fee and features extra legroom plus preferred boarding. The tray table and inflight entertainment monitor are installed in a fixed armrest, therefore, slightly reducing seat width. Floor storage for personal items is not available for use during takeoff and landing. 9 D None No Power Seat 9 D is a standard Economy Class seat located at a bulkhead. The seat is classified as a Main Cabin Extra seat that may be selected for an additional fee and features extra legroom plus preferred boarding. The tray table and inflight entertainment monitor are installed in a fixed armrest, therefore, slightly reducing seat width. Floor storage for personal items is not available for use during takeoff and landing. 9 E None No Power Seat 9 E is a standard Economy Class seat located at a bulkhead. The seat is classified as a Main Cabin Extra seat that may be selected for an additional fee and features extra legroom plus preferred boarding. The tray table and inflight entertainment monitor are installed in a fixed armrest, therefore, slightly reducing seat width. Floor storage for personal items is not available for use during takeoff and landing. 9 F None No Power Seat 9 F is a standard Economy Class seat located at a bulkhead. The seat is classified as a Main Cabin Extra seat that may be selected for an additional fee and features extra legroom plus preferred boarding. The tray table and inflight entertainment monitor are installed in a fixed armrest, therefore, slightly reducing seat width. Floor storage for personal items is not available for use during takeoff and landing. 9 G None No Power Seat 9 G is a standard Economy Class seat located at a bulkhead. The seat is classified as a Main Cabin Extra seat that may be selected for an additional fee and features extra legroom plus preferred boarding. The tray table and inflight entertainment monitor are installed in a fixed armrest, therefore, slightly reducing seat width. Floor storage for personal items is not available for use during takeoff and landing. 9 H None No Power Seat 9 H is a standard Economy Class seat located at a bulkhead. The seat is classified as a Main Cabin Extra seat that may be selected for an additional fee and features extra legroom plus preferred boarding. The tray table and inflight entertainment monitor are installed in a fixed armrest, therefore, slightly reducing seat width. Floor storage for personal items is not available for use during takeoff and landing. 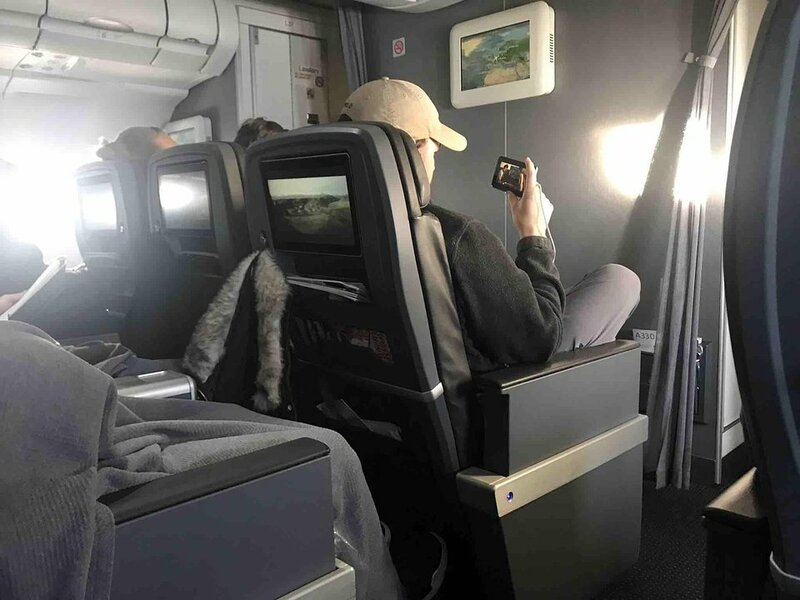 All Business Class seats feature a 15.4-inch HD-capable touchscreen monitor with a selection of up to 75 movies, more than 150 TV programs, More than 350 audio selections, up to 15 games and 5 live steaming television channels (Sport 2, Sport 2 Extra, BBC News, CNBC, CNN). Every Main Cabin Extra and Economy class seatback has an 8.9-inch HD-capable touchscreen monitor with a variety of movies, TV programs, games, and audio selections available. The American Airlines Airbus A330-200 version features Premium Economy seating. 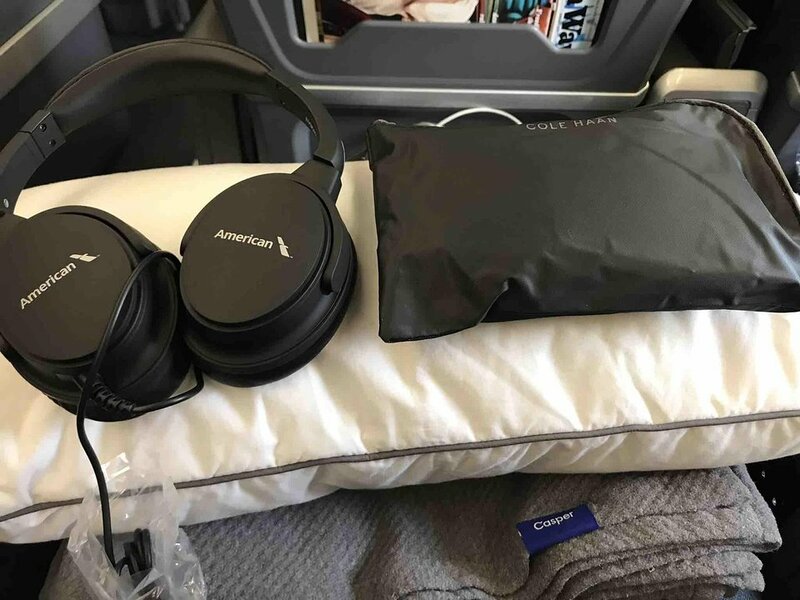 The aircraft is configured with 20 seats that transform into lie-flat beds in Business Class, 21 recliner-style seats in Premium Economy Class, and 206 standard Economy Class seats in the Main Cabin. The Main Cabin also features 50 Main Cabin Extra seats which may be selected for an additional fee for additional legroom and preferred boarding. The aircraft are mainly used on North America to Europe routes. Flew from Madrid to PHL. This indeed not the flagship product, therefore less privacy, even in the window seat. However- This is a great plane with a great bussiness class product. The seat is wide and comfortable, the IFE has a lot of content, the food was great and the crew were wonderful. I had a solid 4.5 hour sleep. The Sundae is a MUST!! I would happily fly this plane again! CLT-DUB This seat was a nice twosome for myself and my older mother. Far enough back in the plane to where the wing was quite further forward, affording a great view of the cloudless skies much of the way to Ireland. Seats were nice and padded, but really didn't recline that much. IFE was of the old touch screen variety, and while the content was fantastic, the hardware was slow and erratic. Like, you touch a movie, 3 seconds later, the screen responds. As always with the A330s, lots of overhead room, relatively quiet, and really comfortable. I reserved seat 4A when I bought my BC ticket 2 months before my flight based on reviews from this site. The day before my flight when I checked in I found that American had changed my seat to 5C with no warning and no explanation. My seat 4A was taken by someone else. 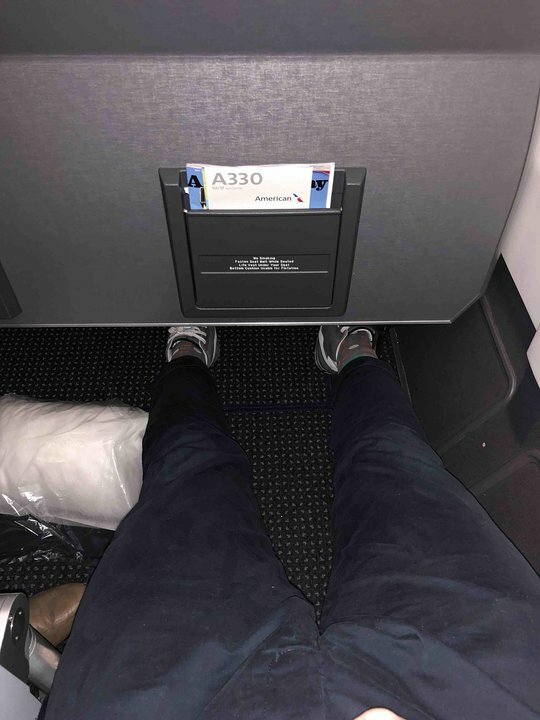 The foot rest section of 5C was broken, there are no partitions between center seats, and the people next to the windows kept them closed the entire time. 5C is a miserable seat. I've flown this bird in biz but this was my first time in premium economy. I was very pleased given that I was essentially paying a coach price. I think row 6 is better than 7/8 because there is a footrest that fold out from under the seat and supports your legs rather than just something for your feet like a bus or train. Rows 7 and 8 have plenty of legroom but 6 has quite a lot. (I moved to an empty seat in row 8 just to see how it was different.) The headphone/power port IS difficult to access but it is usable once you know where it is. I'm an extremely cranky flier and I spent 5 1/2 hours in this seat very comfortably. Overall it's as good as a domestic AA first class seat (not that that's saying a whole lot). I seriously doubt I'll buy first class on this plane again; the price difference doesn't justify the seat difference. Good seat. The width of the leg rest is slightly reduced due to screen storage. I was upgraded to this seat and feared it would be regrettable due to the proximity to the galley. However, the forward galley really wasn't used so it was very quiet and low foot traffic up front. I was on a domestic flight (PHL-SFO) so this may different when the plane is on a TATL route. I flew on this plane with the new premium economy seats in July 2018 and seats 8A and 8H do not have windows. Sat in Premium Economy. Seat was wider and had great leg room. Only problem was the headphone port. It was situated in the very back of the armrest, preventing me from being able to plug it in. The flight attendant even mentioned the need to "be a contortionist." I wanted to see a movie but unfortunately could not due to this issue. But luckily I had a book with me so I just read. I had submitted a comment regarding this to aa.com so I wonder if they fixed this problem. So if you are in Premium Economy, bring a book or your own tablet for entertainment in case you cannot access the jack. American Airlines flies 1 versions of Airbus A330-200.